Fisherville was named after the Fisher family. Jacob Fisher emigrated from Pennsylvania with 22 members of his family in 1797. They were granted a tract of land which was on both sides of Steeles, east of Dufferin Street. They ran a sawmill on the West Don River and later a grist mill which operated with different owners until about 1912. This property was instrumental in the distribution of Insulin throughout Canada under the name of Connaught Labs. Two mills are marked on the 1887 map of the park area, along with their mill ponds. A grist mill located on the second property south of Steeles Ave. is the site of Jacob Fisher’s original mill. I have been unable to find any trace of the saw mill on the second property north of Finch and believe that it was removed during construction of the flood control pond in G. Ross Lord Park. The cemetery from the Presbyterian Church stands on a little rise of land between the East Don River and the retirement home that stands on the former church property. Several stones have been rescued and placed in a common monument. Isabella Watson, whose marker is seen below was born in 1793. That’s the same year that Toronto was founded as York. 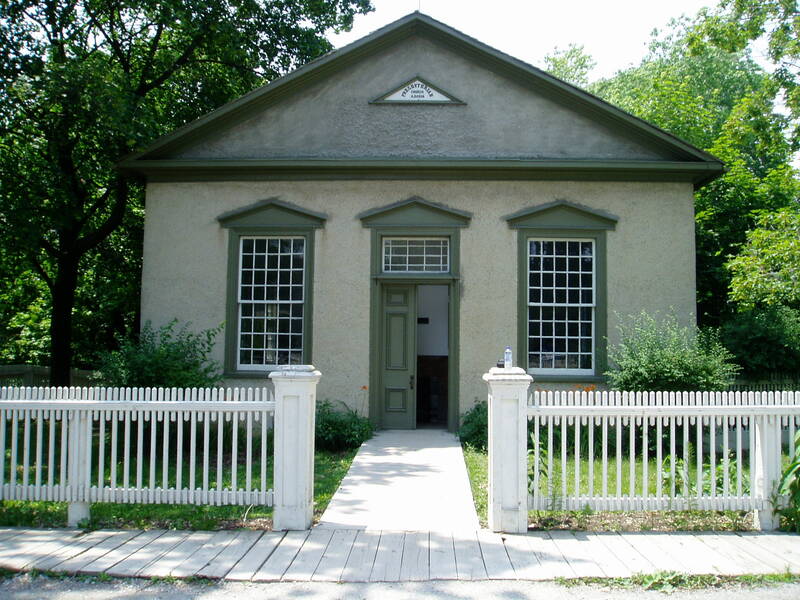 Perhaps the only surviving building from Fisherville is the Presbyterian church which was built in 1856. The cover picture features a painting of the church as it appeared when it was still located near the north east corner of Dufferin and Steeles. The church cemetery remains but the former church site is now a retirement home. Below is a picture I took of the church in 2006 in Black Creek Pioneer Village where it was moved in 1960. I parked in the back of the second parking lot in G. Ross Lord Park. I had only a half hour to explore before I needed to be on my way back to work. The main trail leads past the park facilities and down the hill toward the East Don River. At the bottom of the hill, I made a left and crossed two foot bridges over the river. Around the bend, a single row of pine trees marks the earthen wall of the old dam. The row of trees is broken in the middle of the picture and this is where the river flows through. At this point the earth wall has been removed and the dam in the river destroyed. In the middle of the picture is an old chimney typical of a coal fired steam plant that would have been common around the turn the last century. I believe this is part of the Sanofi Pasteur facility that occupies a large farm in former village of Fisherville. Backtracking to the nearest bridge I entered the woods and climbed the little hill on my right. A deer trail runs along the park side of the Sanofi Pasteur fence. Following this trail, I made my way to the line of pine trees. Where the mill pond berm meets the park embankment there is a section of the earthen wall that is cut away. This is where Fisher drew the water from the mill pond to turn the water wheel on his grist mill. The picture below is taken from the outside of the pond looking up the old raceway. The two larger trees just to the right of centre are growing in the raceway. Just behind where this picture was taken is a square area outlined by pine trees that are growing on the valley floor. The mill was located inside this area. It was common to plant trees around buildings to provide shelter from winter winds and summer sun. From aerial photos I have determined that the mill was removed between 1962 and 1971. There is nothing left of the original foundation but this strip of concrete that would have supported a later addition or repair. Returning to the trail I took another picture which more clearly shows the location of the old mill. Just to the right of centre the pine trees dip down and there is a darker area of trees where they are deeper than a single line. This is the location of the mill as seen from the west side of the river. I first explored this park and found the remains of the old dam in 1997 when I started working in the neighbourhood. It took 17 years to finally stand where the mill once stood. This entry was posted in Don River and tagged Black Creek Pioneer Village, Fisherville, Jacob Fisher on November 13, 2014 by hikingthegta.